Home > Fundraising Regulations > School Raffle Tickets: Can Prizes be Withheld? I recently attended a school Christmas Fair and prior to the event bought several raffle tickets. I was present when the prize draw took place and won a small prize early on and was then amazed to win the main prize. The head teacher however decided that anyone who had already won a prize was not allowed to win another, which resulted in me losing the main prize (which was much more valuable than the others). I asked about this and was advised it was the Head teacher's decision. 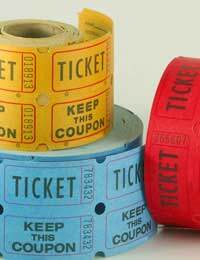 Tickets state that the prize draw is registered under the gambling act 2005 - small society lotteries. Can the school do this? And if so, why are they allowed to sell more than one ticket to each person? The key to this is in the terms and conditions. Do the Ts & Cs stipulate that the organiser is entitled to award prizes solely at their own discretion? If it does, there is no breach of contract. If it doesn’t, then you may (and I repeat, may) have cause for an action under breach of contract. You need to find out whether the raffle (which is known as a ‘lottery’ under the Gambling Act 2005), is licensed directly with the Gambling Commission or is licensed by the Local Authority, which would be the geographical local authority of the school in question. All raffles are required to stipulate that they are governed by the terms of the Gambling Act, which unfortunately doesn’t narrow this down in any way. However, given that you have said it was a ‘small society lottery’ it is likely that the school would have had to register the raffle with the local authority. You may in the first instance want to contact the local authority to explain what has happened and that you are dissatisfied. In the absence of the Ts & Cs stating that prizes are awarded on a discretionary basis (which, it seems to me, defeats the whole object of having a raffle in the first place!) you entered into a draw and were entitled to claim the main prize because you won it fair and square – and for the head teacher to then give it to someone else is a breach of contract. The prize is rightfully yours at the time the number is read out. If you have the winning ticket, then you should be able to claim ownership of the prize to which it corresponds. Proceed with caution however, if you decide to accuse the school of breach of contract. I do not mean to demean the role of teachers in any way, but you do not want any repercussions for your child – whether directly or indirectly. A letter of complaint may be a safer way to proceed. If you do not receive a satisfactory response from the school, you may wish to consult the Citizens Advice Bureau as to the way to proceed in terms of suing for breach of contract. Bear in mind, however, that there would be court fees involved (£30 to issue a claim).